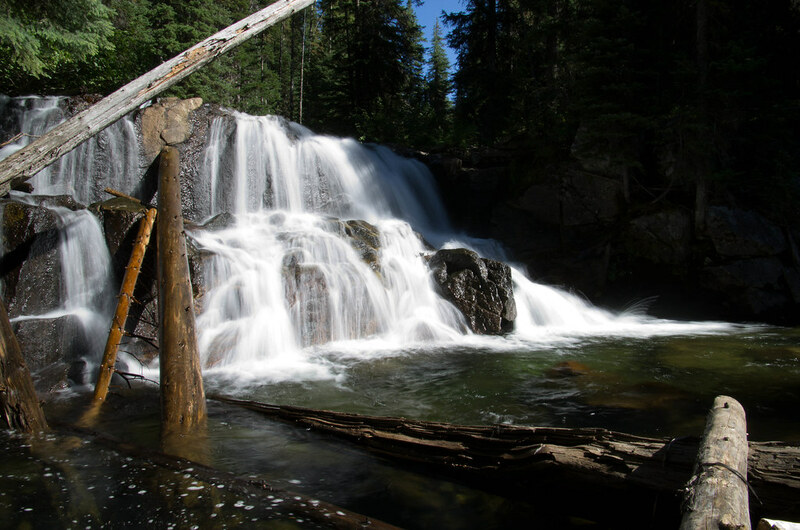 For my third hike this fall into the Eagle Cap Wilderness and the Minam River I decided I would do a long hike. 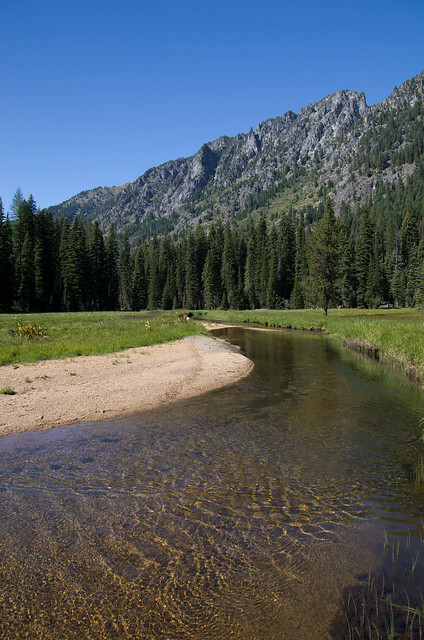 Or an average hike in terms of trails leading to the Minam River in the Eagle Cap Wilderness Area. If my wife was willing to shuttle my vehicle, I decided I would start on the Lostine River at the Bowman trailhead and hike up over the top, past John Henry Lake, through the Wilson Basin, down to the North Minam Meadows where the North Minam River looks like a spring creek, and down the North Minam River to the main Minam River. 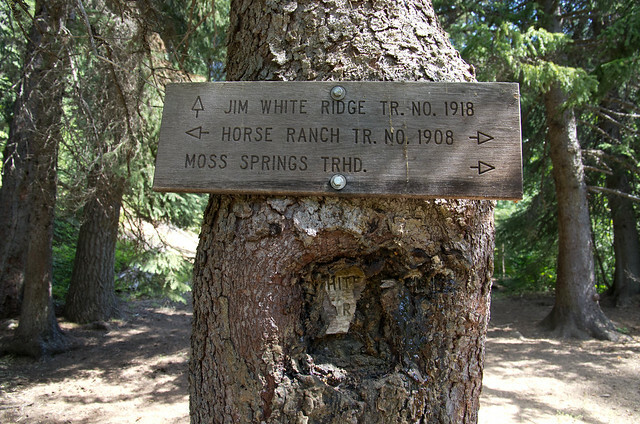 Once there I would fish my way down to Red’s Horse Ranch and then hike out the shorter Moss Springs trail. Here I should say I have a good and understanding wife. Or if not always understanding, at bare minimum an accepting wife. She is always willing to go along with my plans, whether she knows exactly what I am up to or not. And whether she understands my need to visit relatively undisturbed places to hike, camp, and fish in almost complete solitude, she never complains or tries to make me feel bad for loving the things that I love. And the longer I go in life the more I understand that this trait, letting a person be who they are, is rare. I took a four day weekend, giving me a day to hike in, two days to explore, and a last day to hike out. It was labor day after all, at least that was the excuse I told myself to negate the nagging monkey on my back that told me I should work and be materially productive. On Friday morning I drove with my wife and kids in the Explorer up the Lostine River in search of the Bowman trailhead. We had never actually been up the Lostine. Developed campgrounds always give me the impression of being . . . well . . . a little too developed and busy. I go to the woods for simplicity, not for modern conveniences. We were soon slowed down as we got behind some drivers that were much more comfortable on asphalt than gravel. Feeling that 10 mph was a little overcautious I began to feel a little irritated and wished the slow mini-van would pull over and let me find my trailhead. The mini-van pulled into the trailhead and I was a little shocked at how many vehicles were there. The actual trail was across the road from the overcrowded parking area so I drove on past to a wide spot in the road. I pulled over and got my things ready there in the chaos that I am used to: three boys running around with three dogs. After loading my pistol, turning on my GPS, and changing my footwear I told my wife to drive and I would get out at the trail so we didn’t have to brave the parking lot that I thought resembled Wal-mart. She stopped momentarily, Molly (my border collie)and I jumped out and I said “See you in a few days.” We headed up the trail as fast as we could trying to get away from the crowds at the parking lot. I have frankly never seen so many people on a “wilderness” trail. When I was travelling around the Northwest to rodeos we stopped a couple times on the coast at parks with trails and this is what it reminded me of; the city had come to the woods. I am probably exaggerating a bit. But it was a lot compared to what I am used to seeing, which is almost no one. Near the top of the ridge there was a turn off to go to Chimney Lake and the traffic decreased substantially. I guess a lot of those people just hike in there to see lakes. I prefer rivers myself and my destination was many miles in the distance still. After reaching the summit and heading down the other side into the Minam drainage I only saw one other group. Once to the North Minam Meadows a man and woman on horseback went the opposite direction with two pack animals. I had seen the North Minam Meadows for some time from the trail above. Once I was at the bottom I dropped my pack and walked through the meadow to the creek. The water was slow, smooth, and clear. This looked more like a spring creek here than a high mountain river. I walked up stream peering into the water for fish. I spotted some small ones and as I continued along I saw slightly bigger ones darting in and out of mud holes. These fish did not like being in the open water. The water was slow and in many spots the river bottom was dirt with large and small holes in the dirt. It was entertaining to watch small fish dart from one small hole into another only to be chased out by a larger fish that was already occupying that spot. The fish were moving fast enough that I could not tell what species they were. I turned around and decided I would walk downstream. I saw a good sized pod of fish but they quickly spooked as I approached. They swam downstream and regrouped. I got down on my hands and knees and crawled through the grass so I could get a closer look. I was having a hard time telling exactly what they were. They were either brook trout or bull trout because of the light spots on a dark background, but their backs looked a little darker than usual, perhaps a little more dark olive in color than most bull trout I see. After staring for some time I thought I saw some reddish color on their paired fins and dark marks on their dorsal fins indicating that they were probably brook trout. I spooked them a number of times trying to get a closer look and when they all swam away I spotted a few nice 12” fish in the pods each time. I should have walked back to my pack and strung up my flyrod to see exactly what species they were. However I had a long ways to go still so I opted for simply leaving them alone. 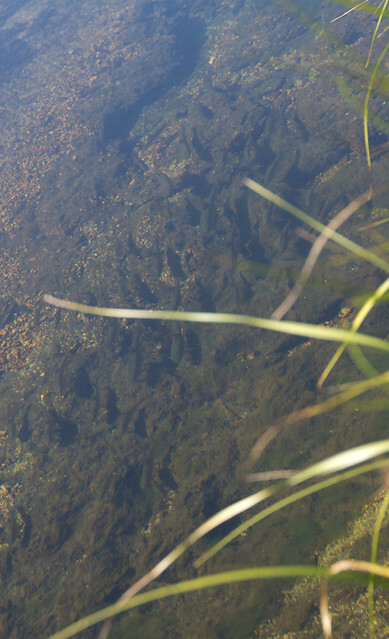 I need to revisit this meadow someday to verify which kind of fish is in there. I had hoped they were bull trout, but left a little downhearted thinking they were probably brook trout. The trail from here more or less follows the North Minam River down to its confluence with the Minam River. A short distance downstream I heard heavy water. I went just a little ways off the trail to try and see what the sound was and I could get a partial view of a waterfall on the North Minam River. I made my way through the fallen trees and thought I had better try and get a good picture of it, so I set my camera up on a rock and then a log since I have not been packing a tripod. 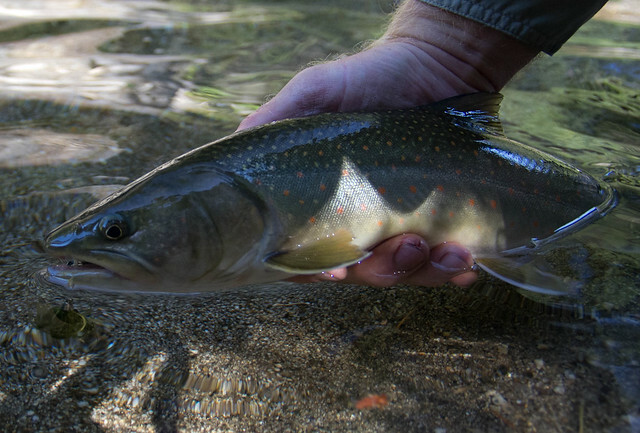 In the pool below the falls I spotted a fish that looked the same as the ones in the meadow and then I spotted another slightly lighter in color fish that I recognized as being a bull trout. That reinforced my thought that the fish in the meadow were brook trout rather than bull trout. A few more miles of walking and I was to the main trail on the Minam River. It was getting close to evening by this point. I had stopped and looked at lots of stuff, so it took me plenty of time to walk the 13+ miles. Rather than walk the trail to find a campsite beside the trail, I walked through the fallen trees following the North Minam to its confluence with the Minam River. Just below I found a nice sandy spot to pitch my tent. I fished some dry flies near camp that night but did not stray far and did not find anything more or less than on my other trips into the Minam: I caught primarily smallish rainbows ten inches or less. The plan for the next three days was to pack up camp each morning and wade and fish my way downstream with my pack. When I felt like I had gone far enough for the day I would pitch my tent and make camp. Saturday morning I packed up and began fishing my way downstream. I primarily fished with an orange stimulator, but tied on a streamer or nymph when I got to a particularly deep run or pool. The fishing continued very similar to what I had experienced on my other trips. There are plenty of rainbows under ten inches willing to rise to a dry fly. I was rather surprised that I did not see or catch any bull trout on Saturday when I fished the deeper runs and pools. I thought the diversity of insect life was increasing quite a bit compared to my trip in the Elk Creek trail. I was now seeing many stonefly shucks on the rocks near the waters edge and the number of cased caddis in the river seemed to be more abundant as well. There were also some good hatches of small bugs that I did not see on the upper river. I did see very small yellow stoneflies on the upper river, but here they were often thick when I shook a branch near the water’s edge. I began to notice quite a bit of weed growth on many of the rocks near the edge. I thought this was a bit unusual for a high mountain stream, but I would assume it is good for insect life and therefore should be good for fish. In general there was more food for the fish and I had hopes of finding some larger trout with influx of more water from the North Minam and a more abundant food source. The fishing was really pretty good, but I did not catch any fish over ten inches on Saturday. The Minam is a beautiful river though. It seems to receive almost no fishing pressure once you get away from the Minam Lodge and Red’s Horse Ranch. I did not see a single person after leaving the North Minam Meadow until I got to Red’s Horse Ranch on Monday. The Minam also changes character often. You will fish a mile or two of nice gravel with runs and riffles, followed by ankle deep flats, followed by tumultuous boulder sections that just drop and drop never slowing down enough to create a pool or run. 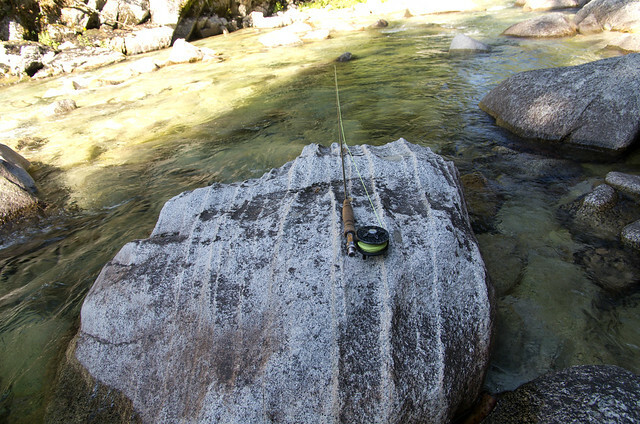 The fast boulder sections do have fish in the pocket water if you take the time to work your fly through the best pieces. Drag is a big issue in these sections as there are more currents then you can count. Short casts are the ticket through these sections, allowing you to deal with 2-3 different current speeds rather than 5 or more different currents. I was hopping along from boulder to boulder in one of these turbulent sections when I slipped and tried to break a piece of granite with my middle finger. I apparently tried some sort of special karate move keeping all the fingers on my right hand straight and trying to drive my hand through the rock. Unfortunately for my middle finger, it is the longest and bore the brunt of the force. After looking to see if I broke my rod I simply laid there for a few minutes not wanting to look at my finger and trying to let the pain subside. My hands look bad enough from the abuse they took riding bucking horses. Several of my knuckles are large and stiff due to the buildup of calcium and cartilage. My pinky on my left hand does not bend at the last joint from being broke and then fusing straight as it healed. All I need is some more ugly half useless fingers I thought. Eventually the pain died down to a throb and I tried to see if I broke my finger or just jammed it good. The end of it looked a little bit like sausage and the joints didn’t want to bend. Some people look at me funny when I take a drink with my left hand because my pinky won’t close all the way and often sticks out, now I thought I might also be flipping people the bird on a permanent basis with my other hand. Happily my middle finger began to bend a little better after several days and sooner or later it should be back to closing easily. Saturday I had made my way from the mouth of the North Minam River to a nice big meadow just above the Minam Falls. It was a pretty spot and I decided there was no better spot to make my camp for the night, from my tent I could look a long distance upstream at a big open meadow and looking downstream was the Minam Falls. I also wanted to see if the fishing was different below the falls than above the falls so I thought waiting to fish below the falls would help keep things clearer in my mind. Besides the falls there are two remnant splash dams just downstream. The three combined may keep some fish from accessing the upper river. There were however lots of dead Chinook and their spawning redds above the falls, so Chinook certainly make it past in decent numbers. I packed my Sierra Designs Origami tent which is basically a modern teepee. If it isn’t too cold I have been pitching it with the sides about a foot off the ground which keeps the air fresh and allows me to see out in all directions. After pitching my tent and eating my dinner I was simply standing around enjoying the evening when I noticed Molly acting a little differently. She was catching the smell of something in the air. She wasn’t growling, but there was definitely something up the meadow from us. I began watching and a black bear appeared. He was right on the edge of the meadow near the tree line and was walking behind some trees as he made his way towards us. He did not see me although I could see him easily. As he went behind a bush I tried to quietly duck down to get my camera and change out the lens. I could still see him making his way down the meadow closer. He finally passed behind my tent about 50 feet away. When I tried to get a picture he saw me and took off at a run up the mountainside. I didn’t even get one good picture. It was nearly dark by that time so I crawled into my tent and did some reading by the light of my headlamp. An hour after the bear sighting I heard something coming through the trees breaking branches as it came. Molly began growling and I grabbed my pistol and rolled out from under the teepee tent with pistol and headlamp pointed towards the sound. I couldn’t see whatever it was as it ran away down the meadow. I stood up to get a better look but whatever it was wasted no time in leaving. I decided I really liked having the tent setup a foot off the ground. It made it really easy for me to roll out without fussing with zippers or anything and I could look straight out the direction the animal was rather than trying to get out a tent door and then peering around the other side of the tent. Sunday I again packed up camp and headed downstream with my pack. The section of river just below the Minam Falls is beautiful. It has many pools and is channeled by granite bedrock on both sides. I came across one piece of granite with grooves worn in it. I was not sure if this was caused by being dragged along in a glacier or simply veins of a harder mineral that is wearing away more slowly. The water below the falls had enough deep pools and runs that I fished a nymph and streamer most of the day and I began to catch a bull trout here and there. I only switched to the stimulator a little throughout the day, but found the same kind of rainbow fishing as I had earlier. I began to see more basalt the closer I got to Red’s and I have to say it gave me kind of a warm feeling. For some reason, the site of basalt ridges made me feel at home much more than the cold white granite peaks of the upper river. I found a great place to pitch a tent a little over a mile upstream from Red’s Horse Ranch. Sunday I fished my way down to Red’s before hiking out to the Moss Springs trailhead. The Minam is a beautiful river and rewarding in many ways. It has fewer bull trout and fewer bigger rainbows than I thought there would be, but it has much to offer besides fishing for big trout. The fishing is reasonably good, just not quite as good as a fisherman would like to imagine when he or she daydreams about a 50 mile wilderness stream with no road and primarily long trails leading to it. I need to explore it more though. There are a couple sections of canyon that I haven’t hiked and fished yet and I really need to try and get in here earlier next year so I can see the river from a different perspective. Thus far I have only fished the Minam at the end of summer. I will have to wait till next year to see if the early season offers anything different. Sounds like a great trip Grant. Hope your finger healed up ok brother. Always look forward to a new post from you. Thanks Kris. Finger is doing better other than a little stiffness here and there, but at least it bends and I am not flipping everybody off. Just let me know what other hard to reach rivers you were wanting to explore and I will do my best to beat you to them And I didn’t completely steal the trip you had imagined for the Minam, although I do now own a pack raft and have plans of using it next spring. I picked up one of the NRS pack rafts, they were more economical than the Alpacka. I will give it a good testing and see how durable it is. We actually picked up two with the idea of renting them to interested parties from the Minam Store. I wanted to give one a good beating first to make sure it would hold up for customers though. If they pass my abuse test, they will be available for rent.